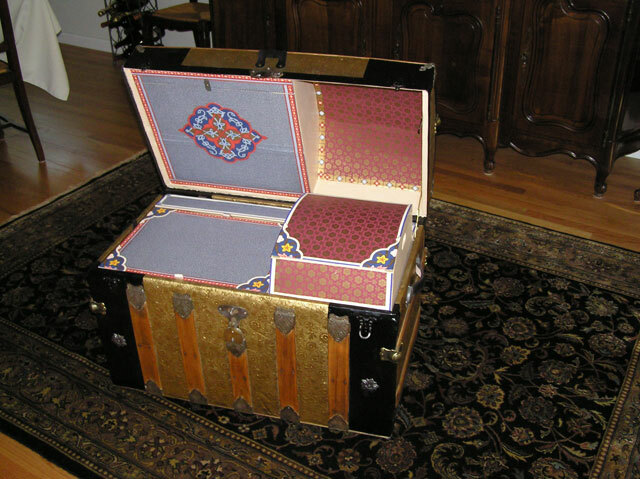 Here is my latest completed project – a restored 1885 Saratoga trunk. I recently picked up this trunk for $20 at an estate sale. It was in terrible shape, badly rusted and many parts missing ( see before pics) . Lettering painted on the oak slates indicated that It was once owned by a M.I. Larsen of Ong, Nebraska. 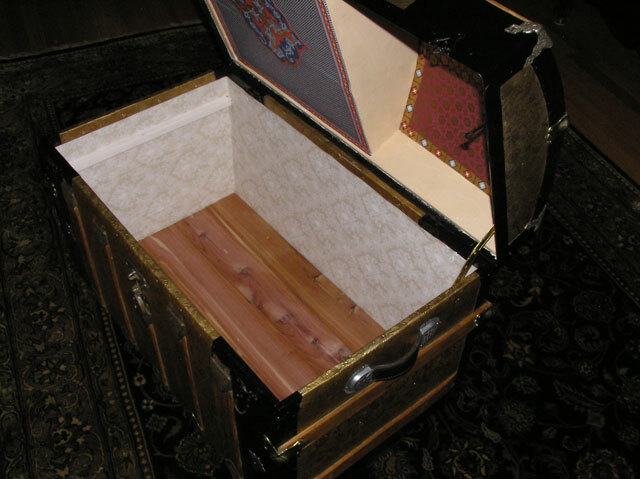 In the late 1860s this type of large round top trunk became popular because it was used by the wealthy people visiting the spas and racetrack at Saratoga Springs, New York. Round top trunks (also called humpback, camelback, monitor top, and barrel top) were made in a wide range of sizes and coverings. They became popular for these reasons: 1) the round top ensured that they were placed on top of the other flat top trunks when they were loaded on to rail cars or ships, - thus minimizing damage to the trunk and its content and 2) when you arrived at your destination, your trunk would be unloaded first and this eliminated waiting at the train station or dock while the hundreds of other trunks were unloaded. This is no different than why people use carry-on luggage today when traveling by plane. The earliest patent date I found was on the trunk tray latch – October 23, 1877. So based on the style of the trunk and the patent date on the tray latch – my date of 1885 seems to be in the ball park. I refinished the exterior and my wife, Sonia finished the interior. She re-lined the interior with reproduction Victorian wallpaper in the same style as the original. Sonia did all the painstaking work of cutting the wallpaper to fit and created all of the wallpaper trim pieces. Because this is very different from what I normally restore, I made many mistakes on this project and ran into a lot of obstacles. Fortunately for me, Sonia was able to give me “outside of the box ideas” to get me back on track. She did an excellent job on the inside of the trunk. Sonia liked this trunk so much that she decided to keep it and store family heirlooms in it (hand woven and embroidered linens made by her grandmother, great grandmother and great great grandmother). These linens were woven from the mid 1800’s to the early 1900’s and are the perfect items to be stored in a magnificent trunk from this same era.